Our Town transports us to Grover’s Corners, a small New England town of dreams and disappointments, loves and losses, where the people are eerily like the ones in our own lives. 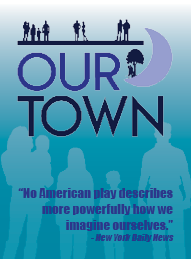 Our Town illuminates the powerful bonds that hold communities together through everyday life and in moments of crisis, as it follows the romance of George Gibbs and Emily Webb into one of the most famous scenes in the American theatre. those interested in principle roles. audition together and/or partners will be assigned at open call. Casting: 23 actors of all ages, types and ethnicities. Thursdays (6:45pm). First rehearsal is Weds Sept. 12. Contact: Matt Andrews, Director: matt.andrews@marist.edu; 845-705-4550. Corners. He/she joins in the action of the play periodically. George Gibbs and her early death. over time and becomes a responsible husband and father. Dr. Gibbs: (35-55) George’s father, the town doctor. Stern and respected. Mrs. Webb: (35-55) Emily’s mother. Serious, crisp. Rebecca Gibbs: (12-16 but can be played by an adult) George’s younger sister. Wally Webb: (12-16 but can be played by an adult) Emily’s younger brother. Joe Crowell: (12-16 but can be played by an adult and either gender) local paperboy. Si Crowell: (12-16 but can be played by an adult and either gender) local paperboy. Howie Newsome: (25-45) the milkman, a fixture of Grover’s Corners. Mrs. Soames: (35-55) a gossipy townswoman, member of choir, graveyard resident. Constable Bill Warren: (40-70) the policeman. Joe Stoddard: (50-70) the undertaker, Choir member. Mr. Carter: (any age) concerned citizen, choir member, grave yard resident. Mrs. Newsome: (25-45) Howie’s wife, choir member, wedding guest. Mrs. Carter: (any age) Citizen, choir member and graveyard resident. Mrs. Crowell: (any age). Citizen, wedding guest and graveyard resident. Mrs. Huckins: (any age). Church organist. Our Town Audition Scenes for download.